Hundreds of residents led by the Rajput community blocked entry to the Kumbhalgarh Fort in Rajsamand district "for some time". 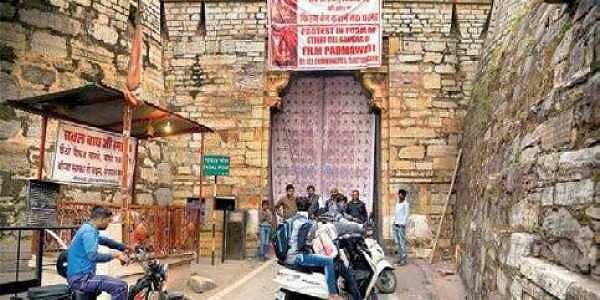 JAIPUR: Hundreds of residents led by the Rajput community today blocked entry to the Kumbhalgarh Fort in Rajsamand district "for some time" demanding a ban on 'Padmavati', a day after a similar protest at Chittorgarh Fort against the movie. The protests against the epic drama based on Rajput queen Padmavati also spread to Kota, where nearly 200 Congress party workers demonstrated against the Sanjay Leela Bhansali- directed film. They hanged an effigy of the filmmaker at a square in the city. The Congress party protesters termed the Censor Board's decision to return the film without certification a "political stunt" amid the proposed state assembly elections in Gujarat. But Central Board of Film Certification chief Prasoon Joshi said today the application for certification for the film was incomplete and thus was sent back. The situation in Chittorgarh was normal today, the SHO of Chittorgarh police station, Omprakash, said. The Circle Officer of Kumbhalgarh, Chandan Singh, said: "The entry was blocked for some time due to the protest and it resumed after the protest was over." He said elaborate security arrangements were made in view of the protest which ended peacefully. The majestic hill fort of Kumbhalgarh is the birthplace of legendary king Maharana Pratap and a Unesco world heritage site. According to the Chittorgarh police station SHO, Devendra Singh, who allegedly shot in the air during the protest at Chittorgarh Fort yesterday, has been booked under the Arms Act, but he was not yet arrested. Rajasthan was yesterday rocked by protests against the film with protesters blocking entry to the Chittorgarh Fort and burning effigies of Bhansali. The entry to the fort remained blocked till 5 pm yesterday. Rajput groups have alleged distortion of historical facts in the period drama starring Padukone, Shahid Kapur and Ranveer Singh.